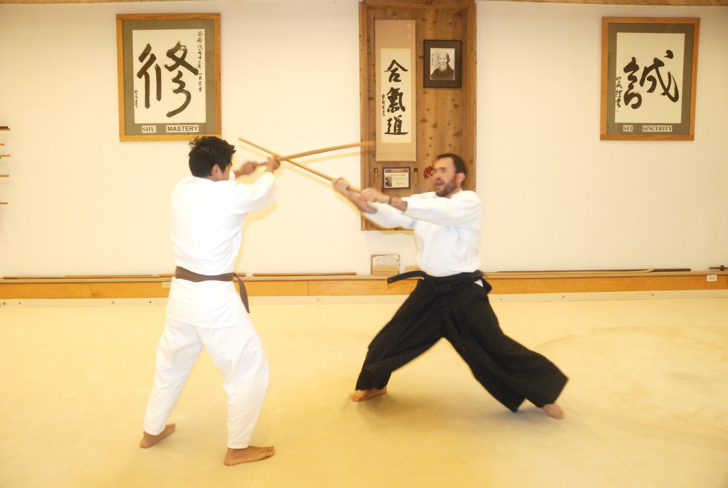 Weapon's training is a normal part of our Aikido training program. 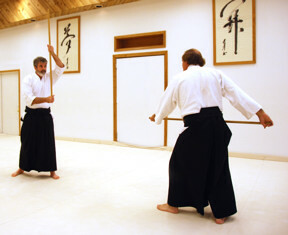 However, there is no requirement to study Aikido for participation in the weapons training. The weapons class is a standalone class that may be taken by students of other martial arts or by anyone interested in learning about weapons. Training in several different weapons is available. The JO is a wooden stick, usually Oak, about 52 to 54 inches long and 1 to 1.25 inches in diameter. Japanese oral tradition has an interesting story about the origin of the Jo. The most famous swordsman in Japanese history was Miyamoto Musashi. He pioneered a type of swordsmanship that employed two swords. About 400 years ago, he was challenged to a duel by another famous Japanese martial artist Muso Gonnosuke Katsuyoshi. Gonnosuke choose to fight the duel using a Bo, a wooden stick about 6 feet long, a weapon that he was very skill with. Legend has it that the duel ended when Gonnosuke delivered a vertical strike with the Bo that Musashi caught in a overhead X block with his two swords. From this position, Gonnosuke could not block a counterattack from the 2 swords. However, Musashi chose to spare Gonnosuke life. Gonnosuke was mortified by his defeat and withdrew to a Shito shrine where he fasted and meditated. After a considerable while, Gonnosuke claimed to receive a divine vision that directed him to shorten the Bo by about 2 feet, thereby creating the Jo. This made the weapon much faster and more maneuverable but still provided a reach advantage over the Japanese sword. Once again Gonnosuke challenged Musashi to a duel. However this time when Musashi blocked the vertical strike with an X block, Gonnosuke was able to reverse the Jo and threatened Musashi with its other end. Musashi conceded defeat and Gonnosuke spared his life. Whether this story is true is debatable. In Musashi's writings, he claimed that he was never defeat. But what is certain is the Jo entered Japanese Martial Arts about 4 hundred years ago. Since a 52 inch oak staff is potentially a lethal weapon, Jo training is highly structure. There is no free sparing. Jo training begins with learning the basic strikes and pokes with the weapon. When some proficiency is obtained with the basics, prearranges individual dance like patterns (katas) are learned. These patterns teach how to perform a series of blocks and strikes. After the katas are learned and there is good control of the weapon, partner practice begins. Prearranged forms are learned in which a series of block attack sequences are learned. The main weapon of the Samurai was their sword. The relationship of the sword to the man was were complicated and achieved almost a religious significance. Since the swords were razor sharp, partner practice would be extremely dangerous as well as being damaging to the swords. So another method of practice was developed involving the wooden sword, bokken. The bokke n is studied as part of Aikido because the martial art of Aikido developed many defensive techniques against sword attack. Before there is need for defense against attack, strong attacks must be mastered. 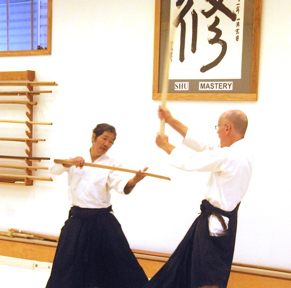 The Bokken training program is similar to the Jo Program. The bokken program is highly structured since the oak sword is also potentially a lethal weapon. Bokken training begins by learning the basic thrusts, strikes and blocks with the sword. The is another type of wooden sword that is called a Shinai. This is the weapon used in Kendo. It is made of split bamboo and is flexible enough that actual contact can be made with an armored opponent. This allows distance and timing of sword strikes to be learned much more rapidly. 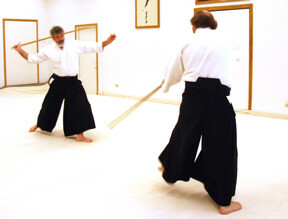 The Shinai is used as part of Aikido training. The receiver of the attack is partially dressed in Kendo armor, so that weapon strikes can occur with no danger. The attacker attacks with full power strikes intended to make contact and the defender uses Aikido techniques to evade the attacks and disarm the attacker. This is very advanced practice that is limited to Black Belts.